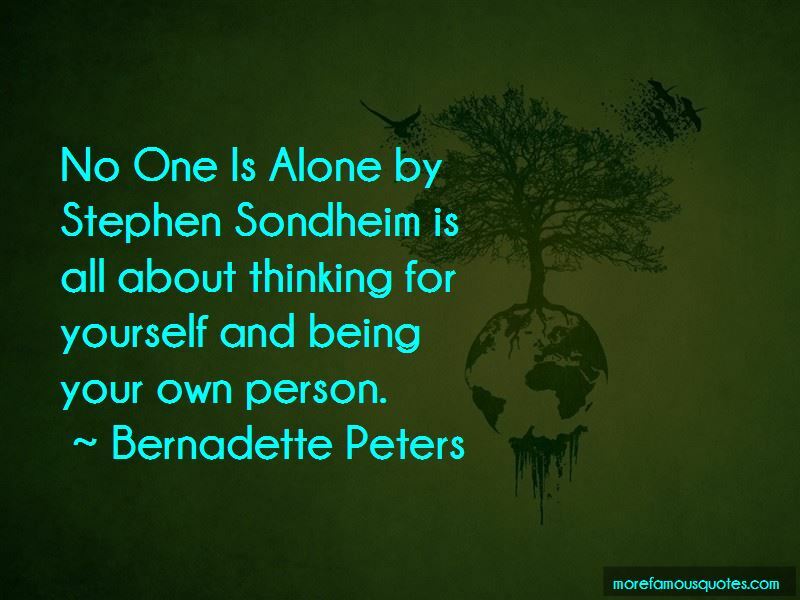 Enjoy reading and share 44 famous quotes about No One Is Alone with everyone. “Sometimes people leave you halfway through the wood. 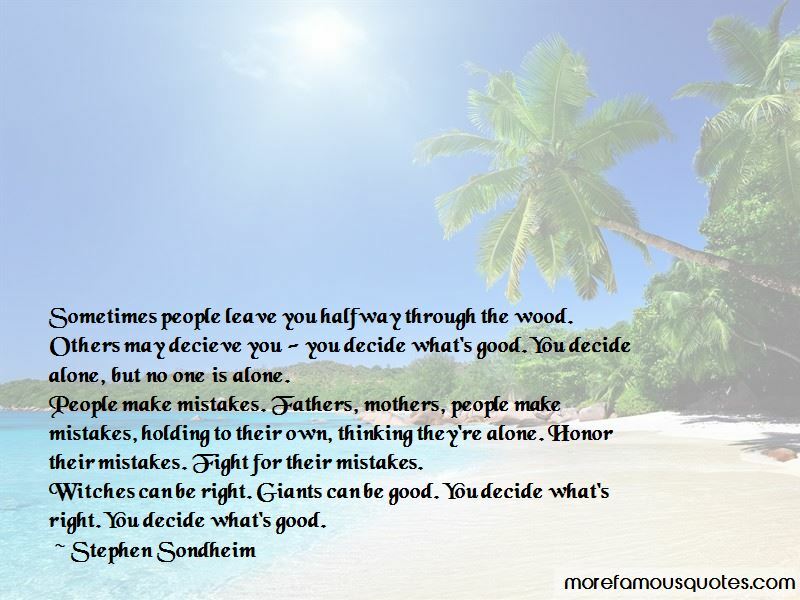 Others may decieve you - you decide what's good. You decide alone, but no one is alone. People make mistakes. Fathers, mothers, people make mistakes, holding to their own, thinking they're alone. Honor their mistakes. Fight for their mistakes. “If losing Sam had taught me anything, it was to seize life-seize everything it had to offer, including the tears, the anger and loss, but most of all, the laughter and the love. “Sure you'll be all right?" Glitch asked, breaking through my thoughts. "I could come with you, if you'd like. They won't even see me." I shook my head. "Better if I do this alone. Besides, there's one member of that household who can see you. And he's seen enough scary monsters to last him a lifetime." "Begging your pardon, your highness," Glitch smirked, "but who are you calling a scary monster?" “This is for you." i pressed the stone in Kerwyn's hand. Kerwyn turned it over in his hands, unimpressed. "imatator's gold? It's worthless." "No, it's real gold. I am real Kerwyn." "'Many may one day claim to be the lost prince of Carthya. You will know the Prince Jaron by one sign alone. He will give you the humblest of rocks and tell you it's gold.'" “A dreadful thing one day befell me when a horse came to stand on my toe. Having no power to remove him, I found that I could not go. “How terrible," said Eragon, "to die alone, separate even from the one who is closest to you." “You have knowledge, and I have skill, and between us we have ... "
"We have the Ring of Erreth-Akbe." 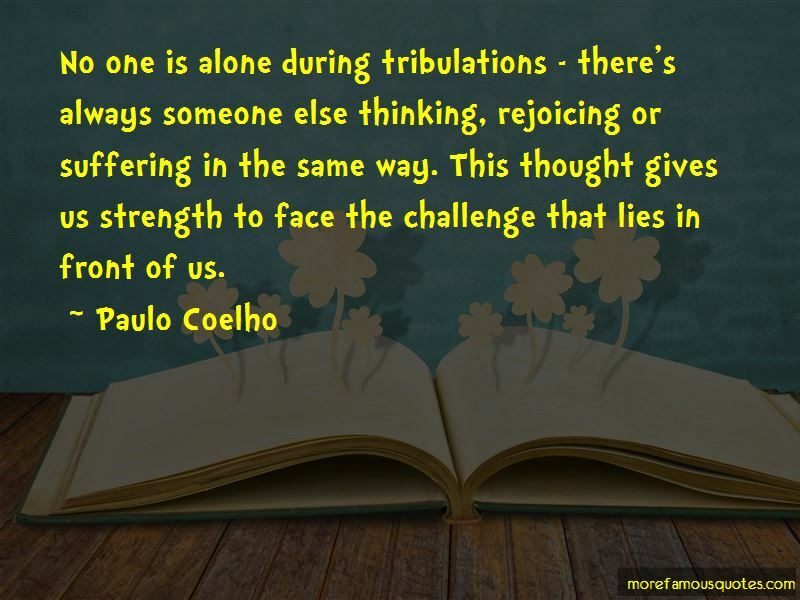 “No one is alone in their troubles; there is always someone else thinking, rejoicing, or suffering in the same way, and that gives us the stregnth to confront the challenge before us. Does that include suffering for love? It includes everything. 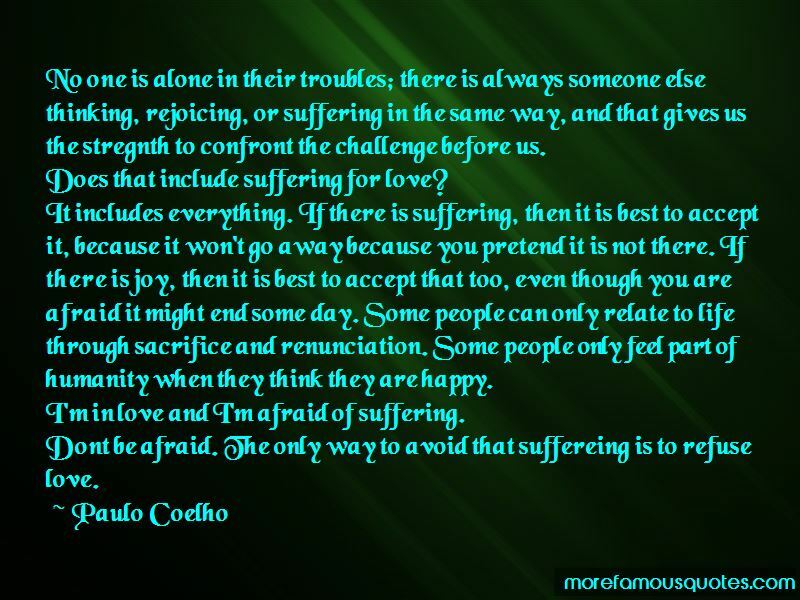 If there is suffering, then it is best to accept it, because it won't go away because you pretend it is not there. If there is joy, then it is best to accept that too, even though you are afraid it might end some day. Some people can only relate to life through sacrifice and renunciation. Some people only feel part of humanity when they think they are happy. I'm in love and I'm afraid of suffering. First, as soon as people decide to confront a problem, they realize that they are far more capable than they thought they were. Second, all energy and all knowledge come from the same unknown source, which we usually call God. What I've tried to do in my life, ever since I first started out on what I believe to be my path, is to honour that energy, to connect up with it every day, to allow myself to be guided by the signs, to learn by doing and not by thinking about doing. Want to see more pictures of No One Is Alone quotes? Click on image of No One Is Alone quotes to view full size.